Marinated Mutton Gravy Recipe, today I’m sharing an easy and delicious mutton curry prepared using simple ingredients. Marinated Mutton Gravy goes very well with poori / roti / rice. Sprinkle lemon juice if it is too spicy. I have updated this old recipe. In the old photo, you can see the masala looks thick because I did’t use pressure cooker and not added much water. Mutton was cooked in its own juice. In the updated recipe, I have made it little watery to serve with roti and rice. Marinated Mutton Gravy is very simple to try and can be tried by even bachelors. Marinate mutton with turmeric powder, curd / yogurt and salt. Cook this marinated mutton with onion, tomato, mint and other indian spices. This is such a simple recipe. You can also try this recipe with prawn or chicken. Some of the other mutton based curry / gravy recipes shared in my blog, Mutton Roganjosh, Hyderabadi Mutton Keema, Chettinadu Mutton Kuzhambu, Gongura Mutton Curry and Mutton Curry Leaves Gravy. If you are looking for indian style mutton recipes, then do check my compiled list of more than 35 varieties of lamb recipes. If you try any of my recipes, then do share your feedback with us. 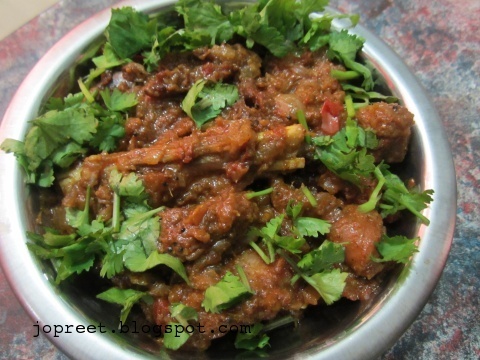 how to prepare marinated mutton curry with step by step photos. Marinate mutton with curd, turmeric powder and little salt for 30 mins. Keep it closed. Heat 3 tbsp oil in a pressure cooker. Add cardamom, bay leaf and broken dry red chilies. Saute a while and add chopped onions and green chili. Fry till it turns golden brown. Add ginger-garlic paste. Saute a while and add mint leaves, marinated lamb along with the paste. Mix well everything and cook for about 5 minutes on low medium flame. Add chopped tomatoes, coriander powder, cumin powder, pepper powder and salt to taste. Now, add 1 cup water and mix well everything. Close the lid with weight and pressure cook for 13-15 whistles. Remove from the heat and allow the pressure to settle. If the curry is watery, then heat for a while. Serve marinated mutton gravy with rice or roti or poori. So tempting and droolworthy mutton gravy, simply inviting. Would love to eat it with rotis.. So tempting, feeling hungry now.